After earlier blog posts on vending-machine coffee in Japan and some fine independent coffee shops in three cities, we return here with our final post on how large chains have influenced the Land of the Rising Sun's exploding coffee industry. Doutor Coffee chain opened their first store in 1980 and greatly expanded the coffee culture in Japan. After World War II, the Japanese went to great lengths in order to recover their economy. They began taking meals and drinks on the go for long commutes or late-night working sessions. Doutor Coffee anticipated this trend and modeled their coffee chain for business-oriented Japanese people. Many associated this successful model with coffee in Japan until the mid-1990s, when Starbucks entered the marketplace with their friendly, casual, “third place” model—a comfortable community space beyond the home and workplace. Doutor has 800 shops in Japan as of early 2017. They're buying coffee beans from about 20 countries, including Brazil, the world's largest producing country, and its own farm in Hawaii. Like other large coffee companies, Doutor has diversified its store brands in terms of price, variety, and location. For example, train-stop Doutor cafes often have cheap food and little variety, whereas Excelsior Cafés are a happy medium of price, taste, and convenience. Still higher quality is Café Colorado, usually located out in suburban areas. Now, at the highest price, they also have Le Café Doutor in ritzier metro areas. Unfortunately for non-smokers, all Doutor cafes “honor the Japanese café culture’s smoking tradition” by allowing smoking, and only some effectively separate smokers from non-smokers. This separation is enough for many, but younger Japanese (especially women) are increasingly looking for non-smoking cafes and restaurants as part of a healthier lifestyle—a trend that may limit their visits to Doutors. 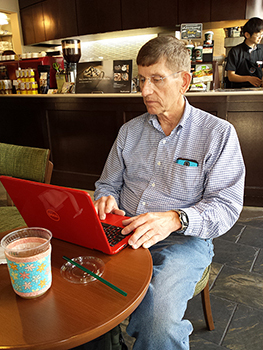 That has pushed many younger consumers toward the non-smoking chains, such as Starbucks. Starbucks in Japan is just as prolific as it is in America, with one or two stores per train station (any train station worth its salt!). In fact, the American coffee company is so popular in Japan that it recently announced plans to buy out its Japanese partner for $900 million and take full control of operations in its second-largest market. They have about 700 shops in Japan, second in size only to Doutor. When Colleen was a new person in Japan (noob), and not a particularly brave noob, she frequented the land of the green mermaid when she first arrived and continued to find them convenient throughout her 3+ years there. Their offer of free countrywide Internet access is a particularly melodic siren song. Not only that, Starbucks requires several of the staff to speak English, so they're always welcoming to English-speaking visitors. When you're new to a foreign country, sometimes you need a taste of home – and you have no shame. Colleen shows off her Hawaiian floral Kup Kollar (TM) cup sleeve from Koffee Kompanions while visiting Starbucks in Tokushima. 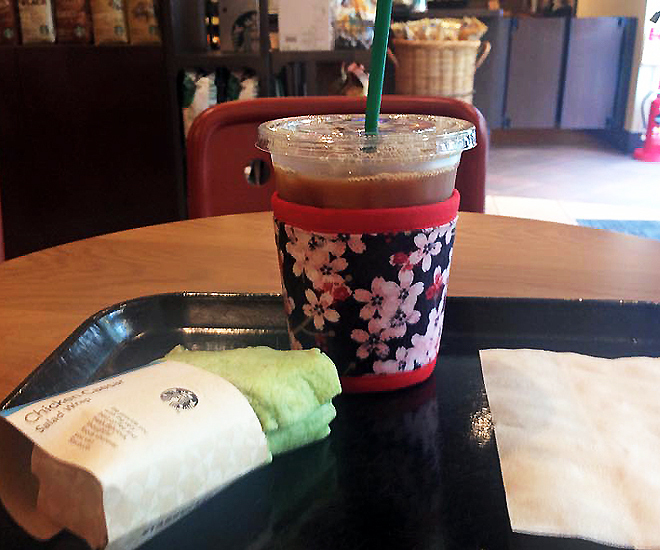 Interesting iced coffee and salad wrap sandwich at Starbucks in Tokushima, Japan, with Cherry Blossoms Kup Kap coffee sleeve by Koffee Kompanions keeping ice from melting in the plastic coffee container. 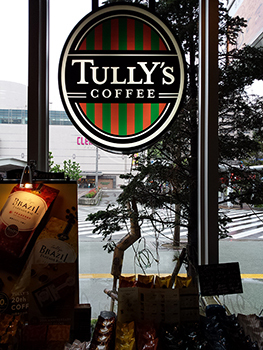 Another successful chain in Japan is Tully's Coffee, which has about 630 shops across the country as of 2016. One of those shops was across the square from Starbucks at Colleen's train station in Tokushima on Shikoku Island--and Tokushima isn't exactly a thriving metropolis! A draw at Tully’s is their extensive menu. When Perry visited Tokushima, he found sandwiches, pasta, hot dogs, pancakes, ice cream and even pizza on the menu. Customers can enjoy these items at the many tables available or get them prepared as “take out” packages. Those with limited time can also choose from an assortment of grab-and-go items placed at the counter near the registers. Like most of Colleen's experiences in Japan, the cultural similarities with America surprised her more than the differences. Seeing a Tully's on arriving in Tokushima was one of those surprises. Perhaps even more surprising, however, was how terrible her cup of coffee was at Tully's in Tokushima. Was it the coffee or bad preparation? With Japan being the land of Outstanding Quality, she tended to blame it on the company itself—or at least the staff at this location. When Perry visited there, he found the coffee generally over-extracted and bitterly strong--a problem common to some other chain coffee shops in Osaka and Kobe. One of Tully's 600+ coffee shops in Japan. This one, at the Tokushima train station, has a good menu and welcoming staff. You may be surprised to learn McDonald’s is the third-largest provider of consumer coffee in Japan. Of course, any of the more than 3,000 McDonald’s stores in Japan will sell a cup of coffee, but the corporation also began establishing standalone Mccafé by Barista coffee shops in 2007. They specialize in a higher-grade coffee and pricier items than normal McDonald’s but otherwise offer pretty much the same menu you’d find at any Starbucks: espressos, cappuccinos, and all those other caffeinated concoctions, with cakes, muffins and other desserts to match. Overall, their prices are less expensive than at Starbucks. With nearly 100 locations in major metropolitan areas (mostly within McDonald's restaurants) as of 2017, they have a couple major advantages over other chains we've mentioned here. They have a high number of 24-hour locations (88 of 100 total) and an increasing number of delivery service cafés (17 of 100 total). They also spice up the menu every now and then with seasonal items, such as last year's caramel popcorn drinks and strawberry sweets. On the down side, some of these items have lasted only a month or two and aren't always welcome to more health-conscious Japanese consumers. A different kind of chain is Caffé Veloce, which launched in Japan as a brand of parent company Chat Noir in 1986. Although neither of us has tried this chain, it's worth mentioning as a "budget-conscious" alternative to those we've mentioned above. It's a chain of about 220 lower-mid-range coffee shops, with many locations in Tokyo and branches in several other Japanese cities. They sport comfortable chairs, lots of counter seating for singles, and small tables for pairs. Unfortunately, some Veloce locations have been slow to separate smoking and nonsmoking sections, and many are simply side-by-side with no barrier in between. Other more updated locations have begun putting in special smoking rooms for a healthier atmosphere. Falling somewhere between a Denny’s drink bar and Tully’s on the quality scale, and cheaper than Doutor and Starbucks, Caffé Veloce offers a decent range of teas and coffees, with surprisingly large and varied sandwiches and few cakes on the side. Some locations offer pasta dishes (as a nod to Veloce's Italian roots), including seafood and a tomato-meat sauce. They're not a substitute for authentic Italian food, but they offer a bit of variety not usually found in Japan. If a budget light meal and a cup of good coffee is what you’re after, this is the place to go. Have you tried coffee and food at a large coffee-chain restaurant in Japan? Let us know what you thought of it in the Comments section below. 120 Years of Mornings--a History of Coffee in Japan and How it Became So Popular, by Rochelle and Viet Hoang, @https://www.tofugu.com/japan/japanese-coffee/ (April 29, 2014). Springtime Means Ice Cream Churning Time!